British Prime Minister Theresa May, center, arrives for a round table meeting at an EU summit in Brussels, Oct. 18, 2018. It had been billed as a “moment of truth” for the tortuous Brexit negotiations that have dragged on for more than a year. But like so many other Brexit encounters, a pre-dinner meeting Wednesday between Britain’s Theresa May and the 27 other national leaders of the European Union passed without the bang of a grand finale or without a breakthrough on Britain’s future relationship with its most important trading partners. British Prime Minister Theresa May arrives for an EU summit in Brussels, Oct. 17, 2018. To the fury of hardline Brexiters in May’s ruling Conservative Party, the biggest takeaway from the Brussels meeting is Britain and its negotiating partners could be heading for many months more of convoluted talks. The British prime minister told her counterparts she would be open to the idea of prolonging Britain’s transition out of the bloc beyond the previously earmarked December 2020. FILE - A car crosses over the border from the Irish Republic into Northern Ireland near the town of Jonesborough, Northern Ireland, Jan. 30, 2017. May committed last year to keeping the border open between the two parts of the island of Ireland, even if Britain leaves the bloc without an exit agreement or a free trade deal. 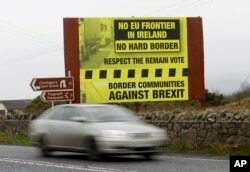 The Irish government is insisting the border remain open as Britain agreed to removing checkpoints in the 1998 Good Friday Agreement — a peace deal struck between London, Dublin and most political parties and armed factions in Northern Ireland that brought to an end decades of violence in Northern Ireland. 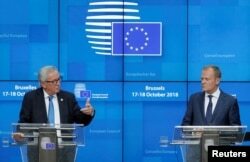 European Commission President Jean-Claude Juncker and European Council President Donald Tusk hold a news conference at the European Union leaders summit in Brussels, Belgium, Oct. 18, 2018. 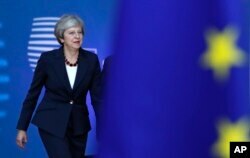 May’s seeming embrace of delaying the timeline avoided an irrevocable falling out with the European Union and allowed her to dodge the moment of truth, according to analysts. Her aides say she has had little choice but to countenance an extension of talks and a prolonged transition amid mounting British government alarm that EU leaders and the bloc’s other national governments are close to pulling the plug entirely on Brexit negotiations, and are ready to accept that Britain may crash out of the bloc without any kind deal. “Mrs. May’s acceptance of an extension to the transition period will take us to the next general election, which may mean we never leave at all,” complained Nigel Farage, the former leader of the UK Independence Party. 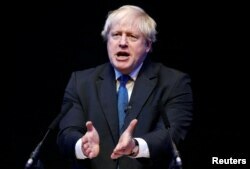 FILE - Boris Johnson speaks at the Conservative Home fringe meeting at the Conservative Party Conference in Birmingham, Britain, Oct. 2, 2018. The possibility that May will agree to a longer transition period has prompted renewed Conservative rebel calls for her to go. “If Theresa May is asking for a longer transition period, she is stalling. It’s time to stand aside and let someone who can negotiate get on with it and deliver,” tweeted Conservative lawmaker Nadine Dorries. British Euro-skeptics oppose Britain remaining in a customs union with the European Union, which is May’s ultimate goal, because they say it would limit Britain’s ability to strike trade deals around the world and force it to abide by rules it will have no power to shape. Meanwhile, positions are hardening among British lawmakers who either don’t want Britain to leave the European Union or want to maintain very close ties with Europe. More of them are supporting a call for another referendum on EU membership, on the grounds that parliament, as well as the ruling party, are hopelessly divided.